If you think that velvet dresses are perfect only for Christmas and New Year’s Eve parties, you’re mistaken. This type of dresses will be great for any occasions, so you need to find a cool casual one for spring days, for sure. 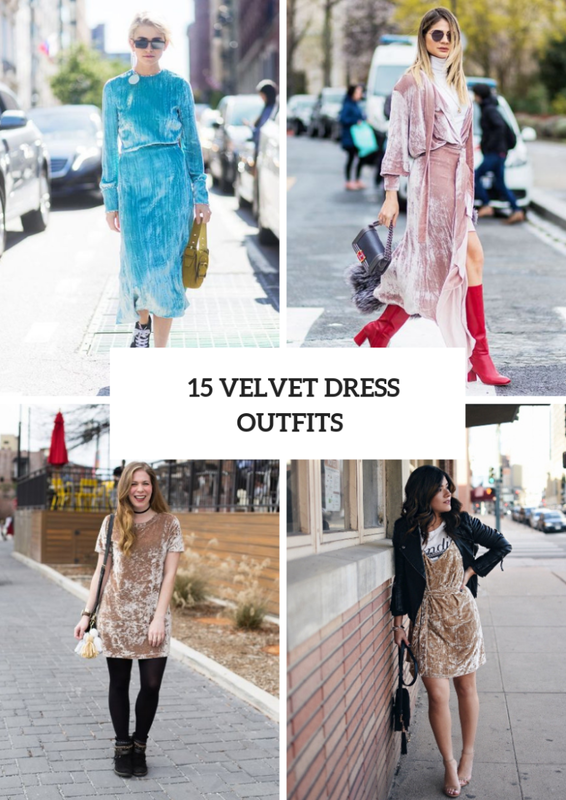 Today I want to show you some stylish and awesome ways how you can combine a velvet dress with other pieces of clothes, for example, from classic blazers to relaxed denim jackets, accessories and shoes. First of all, you need to decide what length and style your dress will have. For example, for the events you can take a wrapped dress and mix them with high heels or cutout boots. Secondly, think about colors, but remember that black, marsala, gray and navy blue ones make your outfits look more expensive and elegant. Scroll down to see all ideas. If you are looking for eye-catching ideas, then you will like a combination with a turquoise velvet maxi dress, black sunglasses, a green small bag and white and black sneakers. Or you can take a white turtleneck mini dress and mix it with rounded sunglasses, red leather high boots, a pale pink velvet wrapped maxi dress and a black leather bag with a fur. If you want to create something casual, then you can choose a beige straight mini dress and pair it with a black crossbody bag, black tights and black flat ankle boots. To make an everyday look you can try to repeat a combination with a loose denim jacket, a pink velvet pleated knee-length dress and a black tote bag. Or you can choose a navy blue velvet dress with a lace and pair it with a gray blazer, a brown leather bag and black ankle strap shoes.